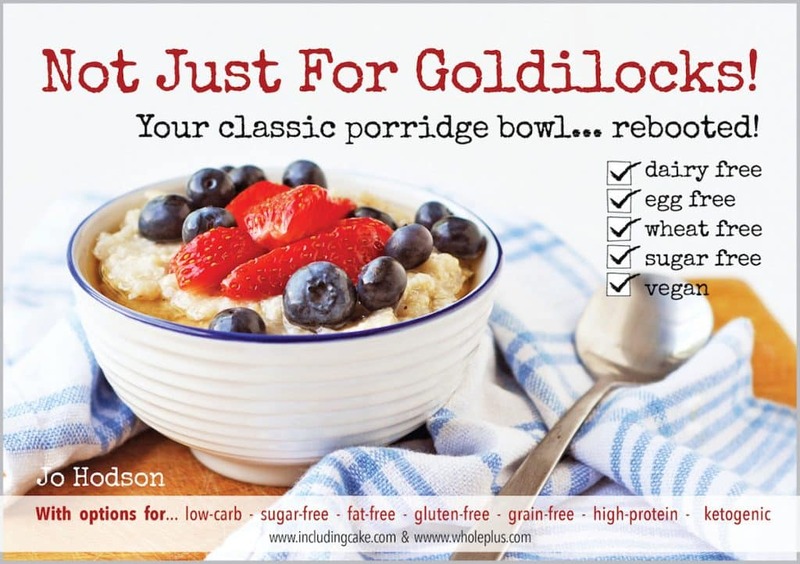 Read my review of “Not Just For Goldilocks! 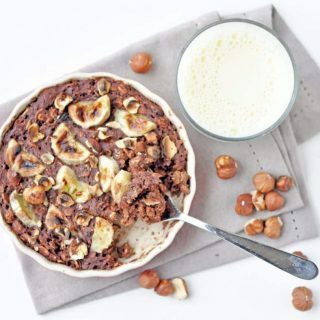 Your classic porridge bowl…rebooted!” and make this mouthwatering Chocolate Banana Hazelnut Baked Oatmeal with a deliciously crusty exterior, a soft, creamy, chocolatey, oaty interior, crunchy roasted hazelnuts and soft, sweet baked banana. When she asked if I would like to review it, I jumped at the chance as I eat oatmeal a lot and I am always on the lookout for new recipes to change it up. I woke up and was checking my email in bed (yes, I am addicted to my phone) and found this beauty of a book in my inbox. Talk about perfect timing! All of the recipes look fab but the Chocolate Banana Hazelnut Baked Oatmeal really caught my eye, so I hopped out of bed and whipped it up right away, leaving it to bake while I showered and got ready for the day. When I returned downstairs the whole house smelled delicious and the Choc Banana Hazelnut Bake looked fantastic. It tasted as good as it looked. With a deliciously crusty exterior, a soft, creamy, chocolatey, oaty interior, crunchy roasted hazelnuts and soft, sweet baked banana. Breakfast couldn’t get much better. My only complaint would be that it said it served two but I ate the whole thing myself. Perhaps the serving sizes are a tad on the small size, or I just eat too much? Let me know what you think when you make it, which I highly recommend you do as it is delicious. Rich chocolate, creamy banana and toasty hazelnuts make the perfect flavour combination. Regardless of portion sizes I recommend you double the recipe as you will want to eat it more than once! It warms up well the next day or you can just eat it cold. Later in the day I also made the Choc Porridge Squares ready for packed lunches and snacks throughout the week. They are so good with peanut butter spread on top! Simple to make and a great healthy snack which conveniently freezes well too. With well over 50 other recipes in the book you will be spoilt for choice. All of them are dairy free, egg free, wheat free, sugar free and vegan and there are options for low carb, fat free, gluten free, grain free, high protein and ketogenic diets. I think my breakfasts are well and truly covered for the foreseeable future! As well as recipes such as the ones listed above, there are topping ideas and recipes, tips, nutritional information and handy conversion notes. All of the recipes are quick and easy with minimal prep time, short ingredient lists and very easy to follow instructions. I love that the measurements are in cups too which surprised me as Jo lives in England where cup measurements aren’t often used. The book is laid out well with easy to read text and great photos of each dish. There are traditional type recipes using ingredients that you would easily associate with oatmeal, interspersed with inventive recipes containing ingredients that I would never ever have thought to use with oatmeal such as turmeric, tofu and cauliflower. They might sound strange but believe me, the recipes look and taste great. Jo has kindly offered to let my readers have 20% off their purchase of “Not Just For Goldilocks”. Visit this link to purchase and use the code GOLDILOCKS20 at checkout to get your discount. The code is good until the end of November 2015. 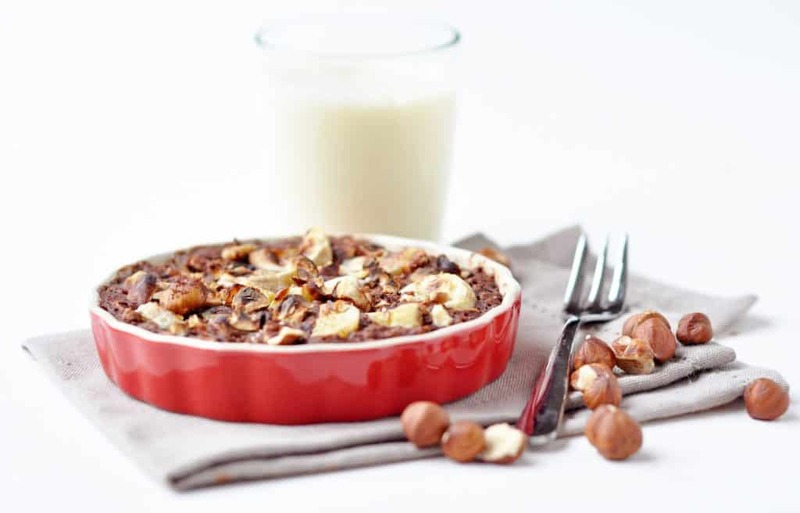 You can find the recipe for theChocolate Banana Hazelnut Baked Oatmeal below. Leave a comment to let me know if you enjoyed it as much as me and share your pictures with me on Instagram or Twitter. I am @avirtualvegan on both. Use the #avirtualvegan on Instagram so I don’t miss anything. If you are hungry for more oatmeal after trying Jo’s Choc Banana Hazelnut Bake then be sure to try my Pear & Walnut Oatmeal with Salted Chocolate Sauce . Mix all dry ingredients together in a medium bowl, add the mashed banana and sweetener to the milk, then mix all into the dry ingredients. Arrange the sliced banana on top of the mixture once spooned into a pie dish. Drizzle a little syrup on top as desired. That looks delicious but would you mind sharing the grain free version? There isn’t actually a grain free version of this in the book. I think it would probably work if you subbed the oats with coconut flour or ground almonds though. I have some coconut flour so might give that a try at some point. If it works out ok I will post it. Ok, thanks. I’ll give it a try with almond flour or meal. this looks wonderful! I love hazelnuts, great addition! Thank you! Hazelnuts and chocolate make everything better! ? Thanks Gin…You can’t beat cooking smells filling the house! Who needs air freshener??? ? What a cute book name! I love chocolate and hazelnut and have a “Nutella” baked oatmeal coming. I love oats so much and eat them nearly everyday. What a great recipe! It is a fab recipe and you can’t beat oats for breakfast. They keep you full for so long and are so incredibly good for you! I look forward to seeing your “Nutella” baked oatmeal…another one for my oaty breakfast rotation! Great flavours. I was amused at the egg free comment though, if anyone is making porridge with eggs then they are doing it wrong! Thanks Jac. It’s a baked oatmeal/porridge and non vegan versions typically use egg to set it. Also some of the other recipes are for oatmeal bars, slices etc which would typically use eggs, hence the egg free statement. Lol you are so funny Levan and if you carry on typing like that I might just smack you as you made me go cross eyed trying to read it!! ? This sounds so delicious! I love anything with roasted hazelnuts! Yum! This sounds delicious! So many great flavors. And I’m loving the cookbook name! That sounds so good! What a great theme for a cookbook. Yes it is. I am sure it will be very popular. This looks awesome for a weekend breakfast…excited to whip it up! Thanks Danielle and yes it makes a great weekend brunch! Breakfast is pretty much my favorite thing ever so I love the idea of a book dedicated just to porridge!! Fantastic! 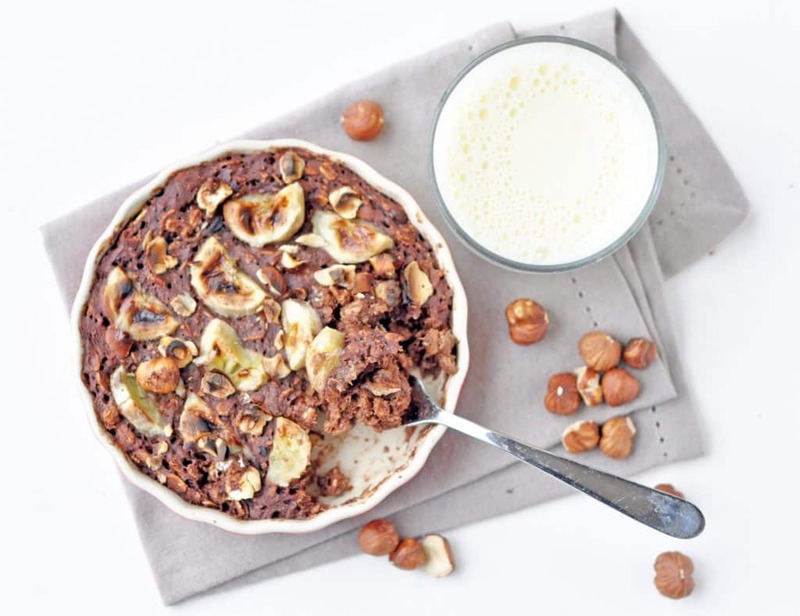 This Chocolate Banana Hazelnut Bake looks and sounds so delicious! Thanks Jenn and yes I agree with you about breakfast! It does look kind of like a pie in that photo! I can totally see how you ate both servings in 1 sitting. It’s not your fault as this looks amazing. I need to try it! Make sure you make double! ? Thank you and you are very welcome! Loving your pumpkin seed oil face serum recipe too!